The San Diego California eye injury lawyers at the Law Offices of DiMarco | Araujo | Montevideo know just how devastating an eye injury can be. They have witnessed it over their thirty plus years of experience helping eye injury patients win their cases and recover their maximum possible compensation. We will be with you all the way. Our team of experienced San Diego work injury lawyers and our dedicated staff are ready to begin helping you and preparing your case. 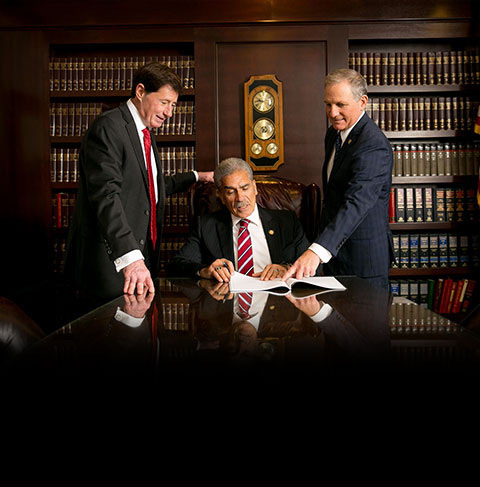 It is important to discuss your case early on with an attorney who is experienced with your type of injury. Our firm will also ensure that you are receiving proper medical treatment. Whether the injury to your eye(s) happened at home, at work, in public, in a car or motorized vehicle accident, while playing a sport or anywhere else, our San Diego work injury and personal injury law firm will work diligently for you. Call us today at (619) 946-6466. Eye injuries are trauma, pain or harm to the eyes. Usually, they are when the eye, eyelid, or retina has been perforated, penetrated, fractured, burned by chemicals, cut, burned by UV rays, displaced, or scratched. Being able to retain as much of your vision as possible is the primary objective of most eye injury treatments. Eye injuries are usually caused by two main types: physical and chemical causes. The eye has many natural defenses including the eyelashes, the eyelids, its inset feature, and the eye’s quick reflexes. The following, though, are injuries to the eyes that get beyond those safeguards: skateboarding injuries, work injury, flying shards or pieces of metal, glass, wood, or brick, fistfights, firecracker accidents, violence, defective products, sports injuries like hockey eye injury, football eye injury, tennis eye injury, racquetball eye injury, baseball/softball eye injury, basketball eye injury, soccer eye injury, boxing eye injury, badminton eye injury, lacrosse eye injury, wrestling eye injury, or ice skating eye injury, BB gun accidents, bicycle accidents, fingernail eye scratches, car or automobile accidents, paper eye scratches, motorcycle accidents, crosswalk accidents, pedestrian accidents, and tripping, slipping and falling. Chemicals can be very harmful upon contact with your eyes. One important tip to remember: The severity of stinging that your eye feels after a chemical touches it does not directly relate to how much damage that chemical will cause. Chemicals that do not sting your eye still could be doing a lot of damage, though. Some alkaline (basic) chemicals are good examples of this in that they won’t cause your eyes to sting very much but they will definitely hurt your eyes. Basic chemicals are the ones that have a high pH. They include many types of cement, ammonia, lime, cleaning fluids like most oven cleaners, metal polishes, and chalk dust. Irritants are chemicals that have a neutral pH. They are not basic or acidic. A common example of an irritant is pepper spray. The pH of acids is low. They should mostly damage the front of the eye. Some acids that commonly cause eye injuries are sulfuric acid, hydrochloric acid, nitric acid and sulfurous acid. Hot liquids, welding flashes, corrosive fumes, laser beams, diseases, and molten metal are more causes for eye injuries. For the best possible chance of reaching your Maximum Medical Improvement, you should call a doctor or 911 following the injury to the eye. Our workers’ compensation lawyers in San Diego have assisted clients since the late 1970s with their workers’ compensation claims for eye injuries suffered while working or on the job site. The most typical causes for work related eye injuries are: truck accidents, working with and around heavy objects, motorcycle accidents, falling objects, tractors, mine equipment accidents, table saw accidents, conveyor belts, car/automotive accidents, slip, trip and fall injuries, and construction equipment accidents. The San Diego work injury law firm of DiMarco | Araujo | Montevideo will protect your legal rights for workers’ compensation claims as well as personal injury cases for eye injuries. We know how to investigate your case and injury circumstances to look for a third party that is also at fault in order to maximize your potential compensation under the law. We will also protect you because under California Workers’ Compensation law, your employer cannot penalize or fire you for making a workers’ compensation claim. Serious eye injuries can cause the whole range of injuries from painful scratches to the eyes to a blowout fracture. Perforating eye trauma has occurred when an object has both entered and exited the eye. Penetrating eye trauma has occurred when a foreign object has entered the eye. A non-penetrating eye trauma has occurred when the eye is intact and it’s usually place after it has been hit with force. A blowout fracture of the eye has occurred when blunt force (eg: a flying ball) has fractured the eye. Other results of eye injuries include traumatic optic neuropathy, blood in the eye, eyelid lacerations, snow blindness, corneal abrasions, orbital fractures, arc eye, and hemorrhaging. It is also quite possible for an eye to be poked out by a blunt force, flying object, a tree branch or a piece of equipment. Some complications that happen because of eye injuries include corneal scarring, retinal detachment, and post-traumatic glaucoma. Our retina is the part of the eye that interprets what images our eye sees and converts them into messages that get sent to the brain. This part of our eye can become detached or peel off after trauma, an injury or swelling. Blindness is one possible side effect of detached retinas. The amount of people choosing to have laser eye surgery performed has increased quite a bit over the last twenty years or so. During that time, eye surgeries to implant contact lenses, repair astigmatism, and much more have been developed. These eye procedures do not go perfectly 100% of the time. Negative side-effects of failed eye surgeries can be potentially distracting, very painful, and may have rather adverse results for your vision (eg: double or blurred vision). Eye injury symptoms will vary widely depending on the severity and location of the injury. They include pain, bruising around the eye, inability to keep the eye open, eye redness, double vision, tearing, swelling, sensitivity to light, temporary blindness, and the inability or difficulty to move the injured eye. Are “Black Eyes” Eye Injuries? The dark color that is the trademark for black eyes actually comes from swelling under the facial skin around the eye after an injury to the head, face, or eyes. It does not directly signal an eye injury has happened but keep in mind that the eye could also be injured. Black eyes can also be called ecchymosis. For physical eye injuries, one method of treatment is the utilization of patches. Two different kinds of patches are popular: shield patches and pressure patches. Shield patches are prescribed for the injured eye when the doctor has cleared the eye injury victim to open their eye under the patch and the doctor does not want to put any pressure or tension on the injured eye. Pressure patches, though, are used when the doctor’s desire is for the victim to keep tension on the eye and for them to keep from opening their eye. Stitching is another possible treatment for eye injuries like eye lacerations. Eye surgery may be needed if the eye or orbit has fractured or there are other serious injury symptoms or problems. For chemical eye injuries, sterile water is usually utilized to flush the eyes. It is very important to get help as soon as possible for chemical eye injuries. There are many types of eye surgeries. Some common surgeries for eyes are cataract surgery, oculoplastic surgery (or reconstructing the eye), vitreo-retinal surgery, eye muscle surgery, canaloplasty, corneal surgery, glaucoma surgery, and eyelid surgery. Call the San Diego eye injury attorneys today to schedule your free case evaluation and initial consultation. You will meet with a lawyer who will want to discuss how your injury happened and where it happened. Then, the lawyer will talk about your legal options going forward, what your case would look like and what our injury law firm could do for you and your family. We have helped thousands of people over the last thirty plus years. We work for our clients on a contingency basis. This means that you will not pay us or owe us anything unless and until we win your injury case. The eye injury lawyers at DiMarco | Araujo | Montevideo San Diego will come to you at your home or your hospital room if you are unable to come to our office. We are available to meet during Monday through Friday between 8:30am and 5:30pm but we will also meet you, by appointment, in the evening and on Saturdays and Sundays.